Drive into downtown Kingsburg on a rainy night and it’s dark…really dark. Hey, there’s a light over there, down the block from the library! What is it? Diners in Visalia, Tulare, and Hanford are familiar with Fugazzi’s, but the Kingsburg restaurant is the first branch in Fresno County. I hope it grows into more new territory. Even in the rain, the place fills up nicely. Don’t expect quiet conversation; the noise of the crowd almost covers up any music playing (I think the hubbub is everybody talking about how good their food is.). The prices are upscale-ish, but so is the food. The menu isn’t quite as fancy and foodie as The Schoolhouse near Sanger, but at least you don’t have to get a loan to eat here. Waiting for the meal? Here comes a tray of bread. 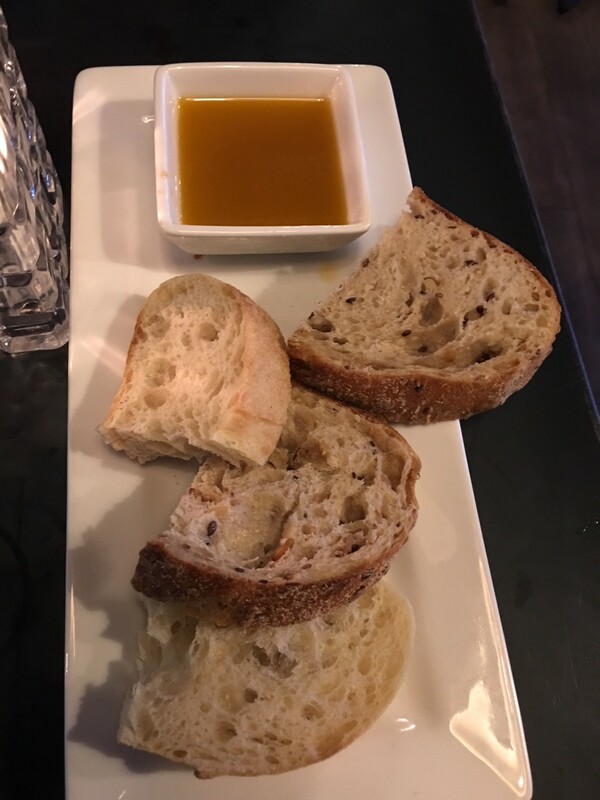 A fluffy Ciabatta shares space with a seven-grain Battard (like a shorter, plumper baguette) that soars beyond the level of mere Bread to become Food. Try the chef-made dipping sauce and you’ll be in love at first munch. 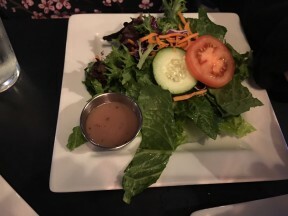 The salad has no iceberg in sight, thankfully (I like my lettuce with some curl of its own), and the raspberry vinaigrette is of noble stock (There is a Caesar alternative). Breads and dipping sauce at Fugazzi’s in Kingsburg. Oh, so good! The menu is Italian with a twist or two, along with steaks and other meats. Sure, there’s ravioli, but the Portobello Ravioli with mushroom cream sauce has a brain-ripping richness that soothes the palate (imagine home-made cream of mushroom with depth-charge surprises). My wife’s Blackened Salmon was far larger than the cigarette-pack size you often get. Soft and buttery, with a pinkness that could only be called salmon-colored, it was moist and flavorful. 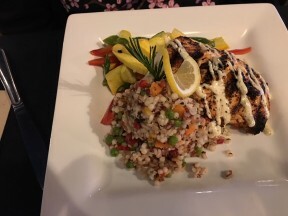 It came with a blackened vegetable couscous (dotted with peas and carrot cubes) and a side combination of zucchini and asparagus that lights up your eyes. Salad and raspberry vinaigrette on the side. The Crème Brulee Cheesecake is eminently sharable, easily enough for two, but you might feel like a leprechaun and want to keep all that gold for yourself. Tap into the torched top, and it fractures like thin ice ventured upon by a tutu-clad hippo, plunging the fork and the diner into depths of delight. The cheesecake is fluffy and full-bodied, not heavy. The other desserts sound scrumptious, and the ones I saw looked even better than they seemed in print. There is a full bar, and the room is stylish with gentle lighting that lets you see your tablemates and the menu, but doesn’t look clinical. I’ve always had a fear of café tables, being balance-challenged, but a bank of cushioned seating along the wall put me at ease, and the stable table didn’t shake at all, and my petite wife didn’t feel like she was sitting in a toddler’s high chair, even though she was at a raised height. Crime Brûlée Cheesecake. Be still, my heart! The waitstaff seemed to be there at the very moment you needed them, yet they didn’t hover. Despite a full house, the waiting time was minimal. An Indianapolis pit crew couldn’t reset tables any faster than this team. Travelers using dining apps were steered off the freeway, and they were happy they did. Social media sites glow with praise for the food and service. Go to Fugazzi’s in Kingsburg. You’ll be glad you did. Fugazzi’s Bistro is at 1335 Draper St, Kingsburg. Call (559) 419-9865 for reservations and prepare to be pleased…a lot. Like them on Facebook. 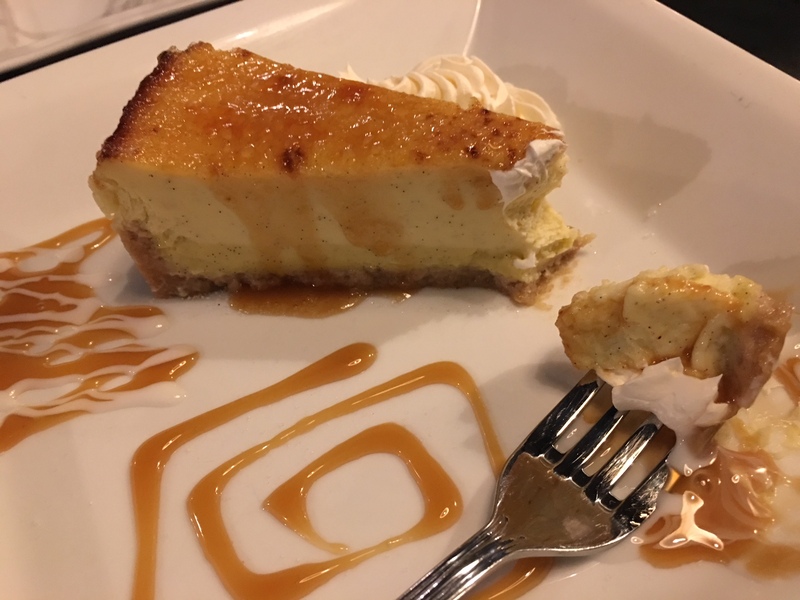 The cheesecake is so good it’s illegal – “Crime Brulee”, HA! You’re hilarious!